You will find the latest styles, colors, and trends here at Team Cutters! We pride ourselves on education and providing the highest level of customer service possible. Whether you are looking to maintain your look, or start fresh, our Team of experienced stylists will happily help you look and feel your very best! Ask one of our Team members to help find the perfect cut, color or curl for you. This is a complimentary service. Reduced prices for children under age 15.
shade for you. This service includes a hairstyle. Additional charge for multiple processes and color. Give your style a boost. Prices will vary according to the length and texture of your hair. A consultation is required prior to the day of your appointment. ***Technical Services guarnteed only with the use of professional products. An Alaskan note~ Life in Alaska has its many wonderful quirks, one of which is many people have well water instead of city water. The Hard Water Treatment (aka Iron Removal or Malibu) it a great for anyone with well water. It removes any build up from the hair caused by the water. It is the best preperation for well-water-hair before any chemical treatment (color, perms, ect), and ensures you get the most out of your hair color. Stephanie, one of our stylists. 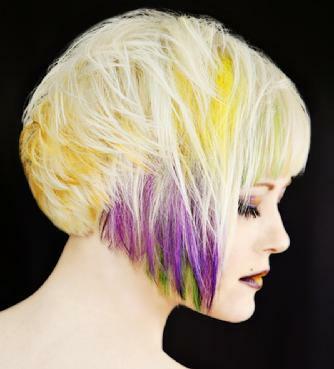 Interested in trying a fun, new, bright color? 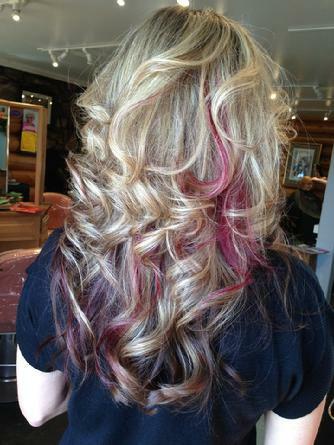 Book a consulation today to talk about your options with a stylist. Consultations are free of charge and are required before a (first time) Elumen-double-process. We gladly offer services for children and welcome them as clients. of your children during your appointment time.